Colin Cheer (third left) bagged a hat-trick in a spell of 5-47 for Bourne against Alford. 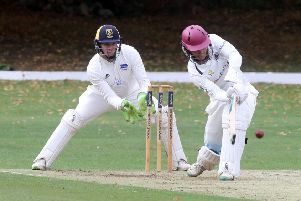 Teenage talent Josh Smith cracked his first Lincs Premier Division ton, but he couldn’t save Market Deeping from another defeat yesterday (June 23). Smith played superbly to make 130 on a belting Outgang Road pitch to push his side to an imposing 50-over total of 294-8 against Sleaford. Dave Gillett weighed in with 51. Josh Smith cracked the first Lincs Premier Division ton of his career against Sleaford. But the visitors also enjoyed the terrific batting conditions to get home with four overs and four wickets to spare. Deeping remain a place outside the drop zone, but they wouldn’t have been pleased with lowly Alford’s surprise three wicket win at Bourne. Bourne were shot out for just 110, but still looked likely to win when bang in-form Colin Cheer - he returned figures of 8-43 last week - claimed a hat-trick to reduce Alford to 44-6. But the underdogs dug in and battled to victory for the loss of just one more wicket. Cheer finished with 5-47. Earlier Carl Wilson (39) and Jack Berry (34) were the only Bourne players to reach double figures. Bourne 110 (C. Wilson 39, J. Berry 34, S. Kirkham 5-37). Market Deeping 294-8 (J. Smith 130, D. Gillett 51).